The Jeannette Bottle Works Company was established in 1887, in Jeannette, Pennsylvania. In 1898 the Jeannette Bottle Works company was succeeded by the Jeannette Glass Company and got its start producing hand made bottles. With the advent of the O’Neill semi-automatic bottle blowing machine in 1899, Jeannette soon found itself producing wide mouth jars, relishes and other useful pressed glass items like automobile headlamp lenses. 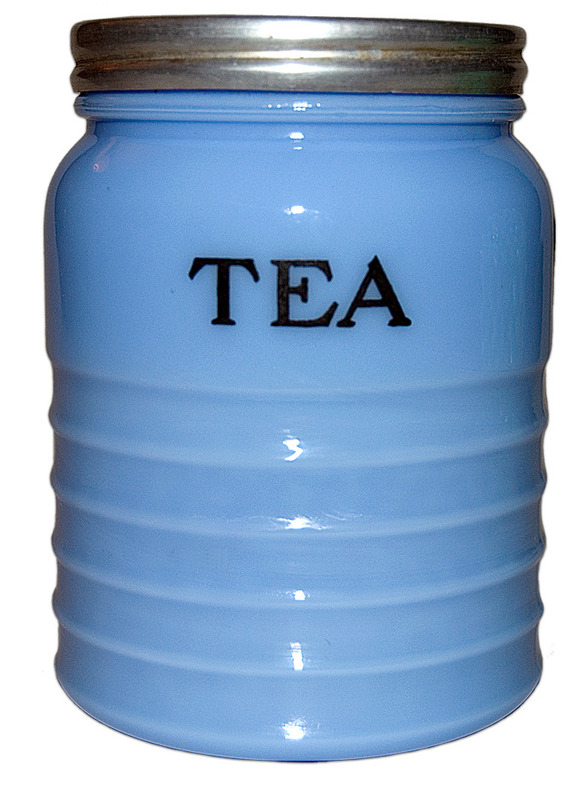 By 1904 the company was involved in producing items for medical and home use. Jeannette continued to grow and expand, and by 1924 they began producing lovely table and kitchenware. This innovative company was one of the forerunners in producing the machine made, colored pressed glassware, we collect today. 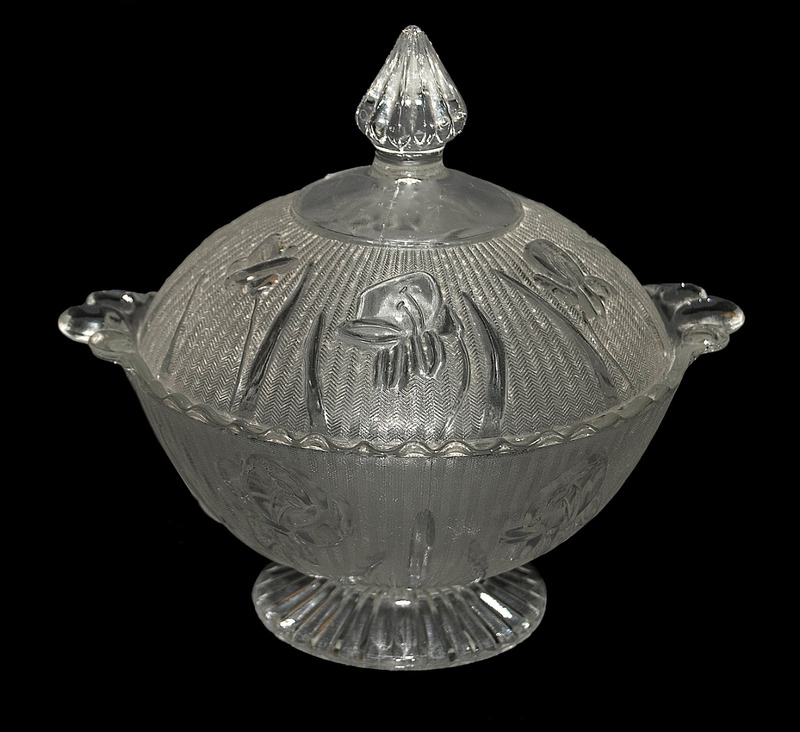 Many of the Depression Glass patterns that we know and love were produced by the Jeannette Glass Company. Some of the more popular patterns produced were Adam, Anniversary, Cherry Blossom, Doric, Doric and Pansy, Floral Poinsettia, Floragold, and Iris. Jeannette established its hold on the kitchen item market early in the Depression Era, designing and producing many kitchen items in pink, green, crystal, delphite, jadite and ultramarine. They were one of the major producers of Jadite and Delphite Glassware. 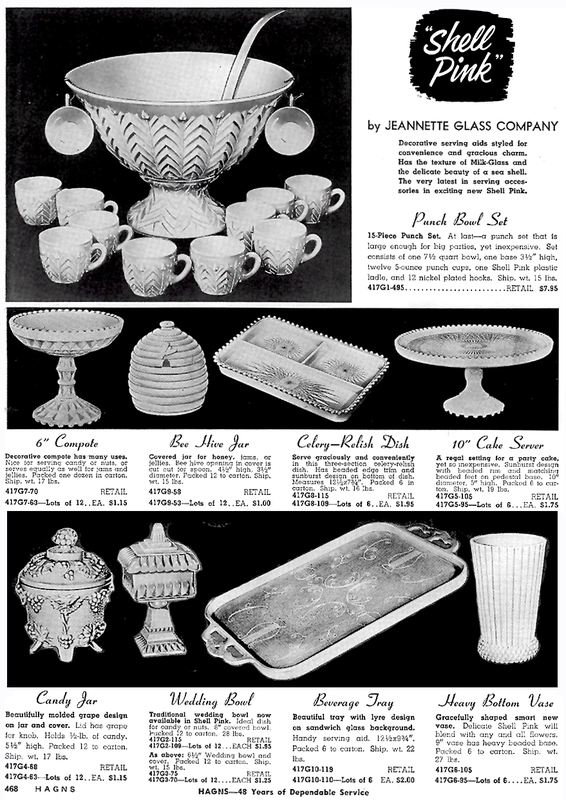 Many of the most desirable Depression Glass kitchen items were made by The Jeannette Glass Company. In 1961 Jeannette bought the old McKee plant which was located in Jeannette and continued to produce glassware for both wholesale and retail businesses, until 1983 when they closed their doors. Anniversary - (1947 - 1949) (Crystal, Iridescent 1970's and later)( Shell Pink 1958-1959) - Anniversary is an interesting pattern produced by the Jeannette Glass Company in various colors from 1947 until 1975. 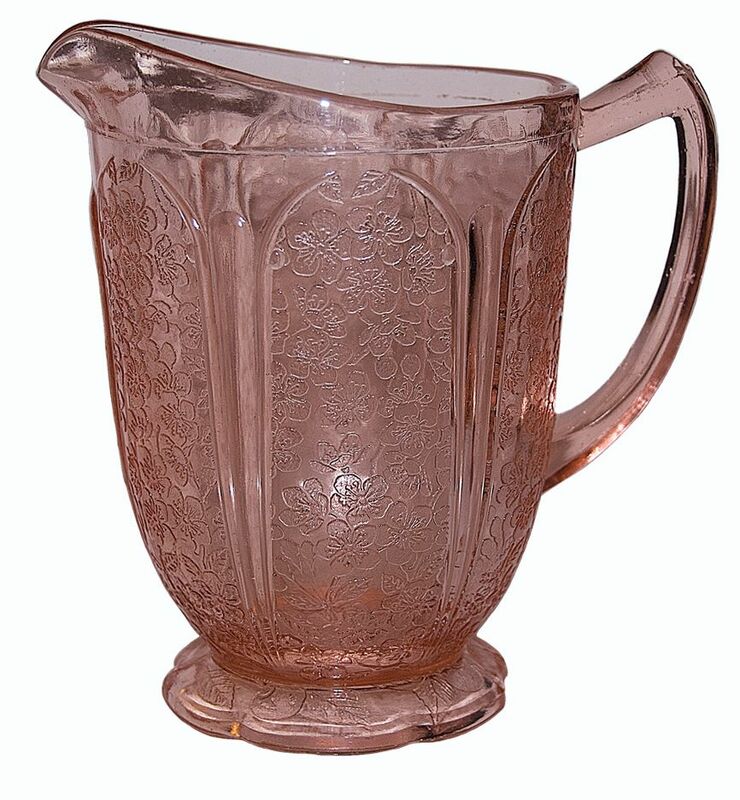 Although Anniversary was introduced in the 1940's, many people lump Anniversary in with Depression Glass because it was listed that way in the first Depression Glass books, and because the pink color is the same hue that was used in Jeannette's earlier Depression Glass patterns. Since this pattern was produced for so many years, it has found it's way into many homes and is very popular today. 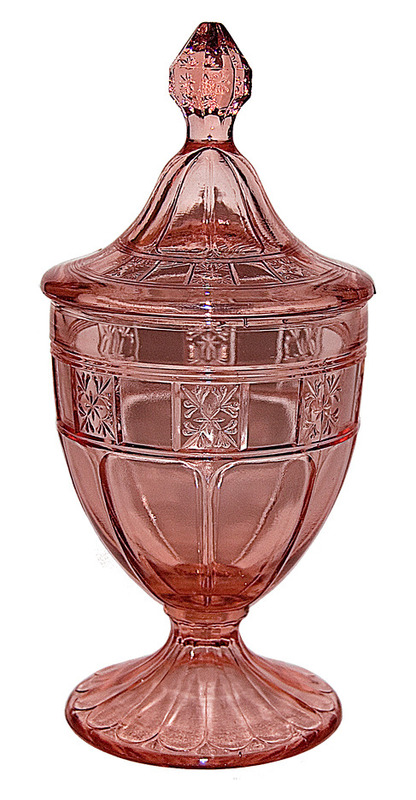 Recently, this pattern crystal vase with a frosted foot has bee seen in retail outlets with a "Made in India" label. Camellia - (Late 1930s - 1951) (Crystal, Iridescent, Gold Trimmed Crystal) - Camellia is a striking luncheon set that was introduced in the late 1930s and continued to be produced until the early 1950s There is an embossed "Camellia" flower in the center area of each piece. This pattern was sold as a luncheon set, however the large 9" plate could easily be used as a dinner plate. Numerous bowls, plates, and trays can be found in this pattern, a snack plate with a matching cup, trays, tidbits, candlesticks, and a sugar and creamer were made. Tom and Jerry sets in both crystal and iridescent may be found. The Tom and Jerry set was made without the lettering and was sold with a 50s Deco metal stand to create a punch set. Cubist - (1929-1933) (Amber, Blue, Crystal, Green, Marigold Iridescent, Pink, White Milk Glass, Ultramarine, Yellow, Experimental Orange Slag) - The Jeannette Glass Company produced Cubist. Cubist is found mainly in crystal, pink, and green, although you do find an occasional piece in the other colors listed above. Pitchers and tumblers are elusive and command a high price. Cubist is often confused with Fostoria's American pattern. 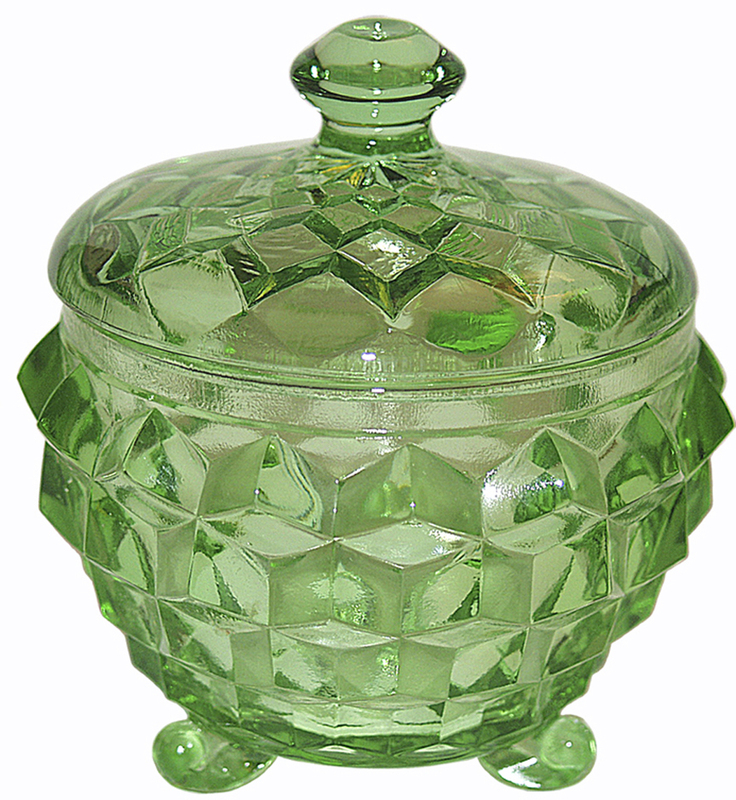 Cubist items were mass produced, machine made Depression Glass while Fostoria's American pattern was hand made. Fostoria's pieces were refired and have a sheen, or shiny luster to them. Dewdrop - (1953- 1955) (Crystal) - This crystal Jeannette Pattern, from the mid 1950's was a very popular luncheon set. The stylish 8" "Maple Leaf" luncheon plate, and the combination snack trays, with an indent for holding a mug impressed friends and family. 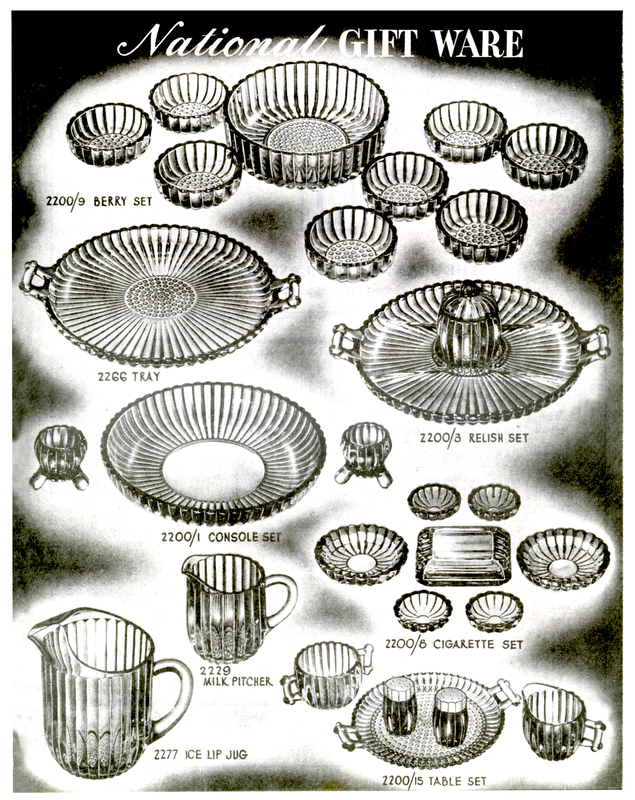 The fact that this pattern had several unique and useful serving pieces is why many homemakers loved buyng and using Dewdrop. Very few luncheon sets from this time period had a revolving lazy susan, or a large punch bowl. Unique pieces like this helped to make this pattern a success. 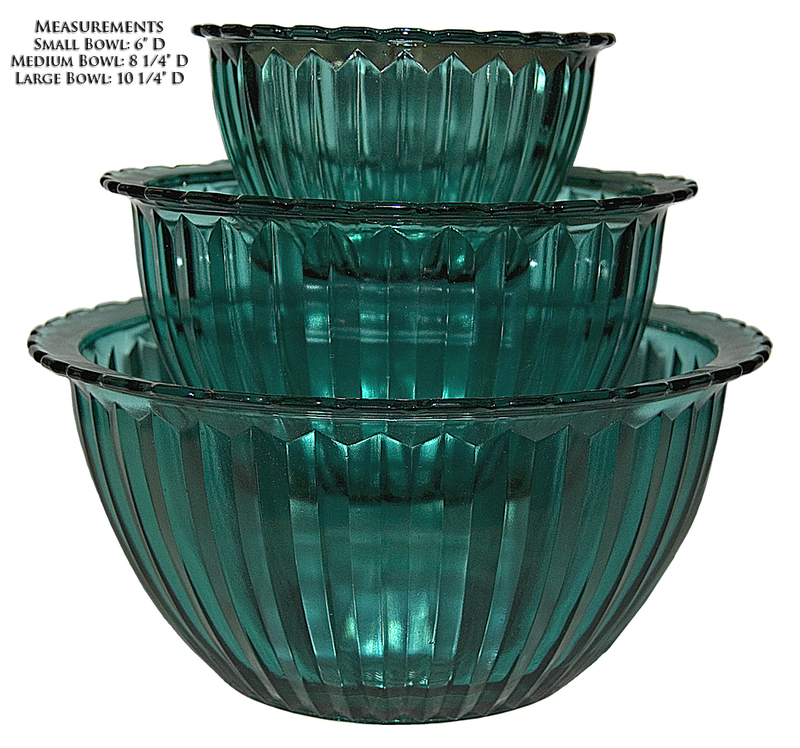 Doric - (1930-39) (Crystal, Delphite, Green, Pink, Ultramarine, Yellow) - Doric was a very popular Depression Glass pattern in both green and pink. It was produced by the Jeannette Glass Company during the 1930s. This striking pattern is hard to find in good shape. Sharp mold lines around the pattern edges were often damaged--even during production. Pink and Green are the only colors in which one can complete a full set. Delphite colored items were limited to serving pieces. Hard to find pieces in pink and green include cereal bowls, cream soups (green only), and tumblers. Doric and Pansy (shown below), is a similar pattern. It can be found in pink and collectors often use pink Doric and Pansy pieces with their pink Doric collections. Doric and Pansy - (1937 - 1938) (Ultramarine, Pink, Crystal) - Ultramarine Doric and Pansy is very much like the Doric pattern shown above. In addition to the border of embossed squares in the Doric pattern, Doric and Pansy has an embossed pansy in every other square. The vertical boxes above, or below the border, also have pansies embossed in them. A complete setting of this pattern can found only in the Ultramarine color. Only a few pieces were made in Crystal and Pink. Jeannette marketed Doric and Pansy in both England and Canada. It was extremely popular in these areas and more of it can be found overseas and in Canada. With the advent of internet selling more pieces of this lovely pattern began showing up on venues such as Etsy and Ebay. It seemed for a time that there were plenty of the harder to find items to go around. These pieces have since disappeared from the market place and the hard to find pieces are again something you will have to search to find. 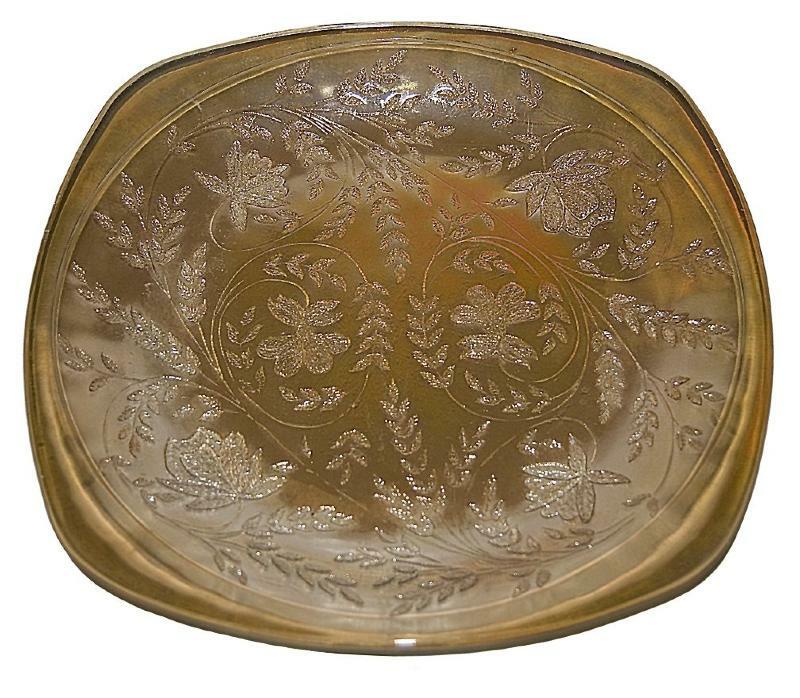 Floragold - (1950s)(Crystal and Iridescent, Some Some Shell Pink Milk glass) - Floragold is one of the Jeannette Glass Company's most popular 1950s patterns. This lovely pattern was a full service dinnerware set. Most pieces of Floragold were mass produced and were reasonably priced, but some items such as the cereal bowls, ice tea tumblers, and vases were sold as extra pieces. These pieces were higher priced originally and not as many customers purchased them for their sets. They are harder to find as a result. Jeannette also experimented with this pattern and produced quite a few items that were never put into the regular line. These pieces include several compotes and a seldom seen butter dish. If you are lucky enough to find one of these rare pieces be prepared to pay a premium. Floral - (Poinsettia)-(1931-1935) (Black, Crystal, Custard, Delphite, Jadite, Pink, Red, Yellow) - Floral was named "Poinsettia by collectors before the company name was known, and the name is still used today. This beautiful floral pattern came in an array of colors. While quite a few items came in Delphite, the only colors that you can complete a set in are pink and green. 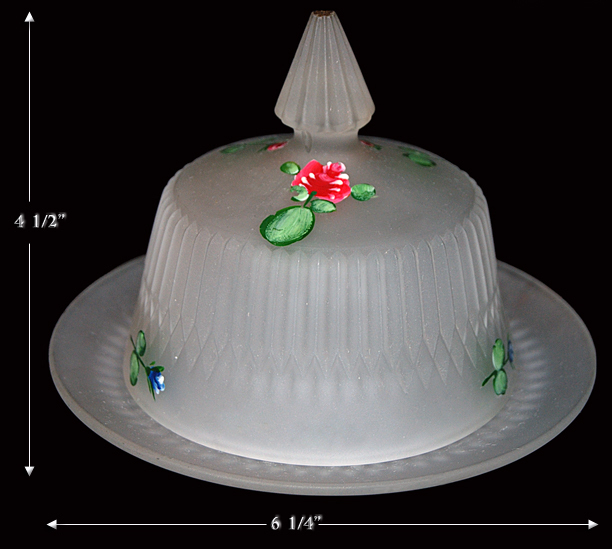 Floral was one of the larger Depression Era Sets produced by the Jeannette Glass Company. Some of the harder to find pieces include the lemonade pitcher, lemonade tumblers, juice pitcher, flat juice tumblers, vases, and vanity items. 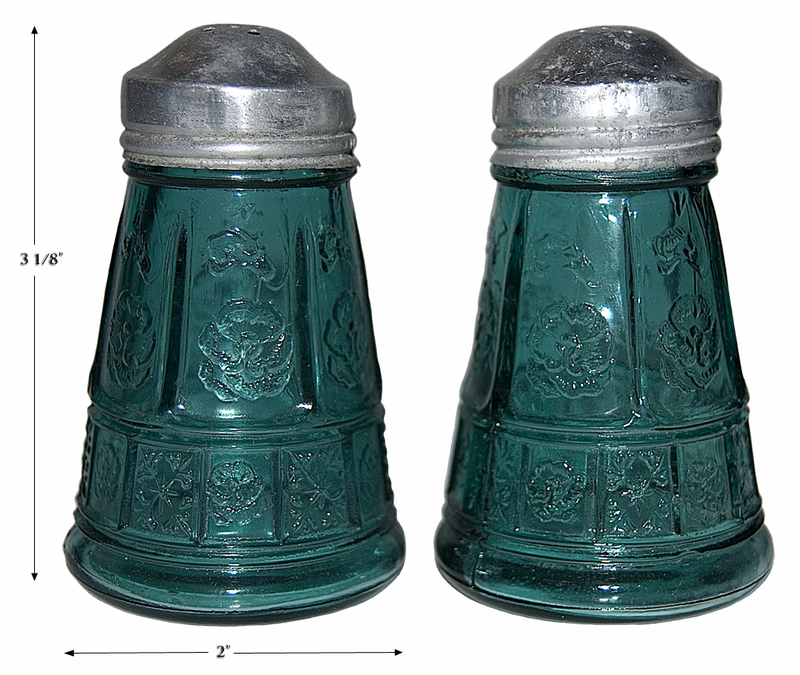 Shakers have been reproduced in this pattern, but are of poor quality when compared to the real thing. The good news is that the footed shakers are the only item that have been reproduced. Harp - (Crystal, Crystal with Gold Trim, Light Blue) - (1950s) - This pattern was dubbed Harp by collectors because of the pretty harp like musical design that decorates each piece. Harp was used as a small luncheon or serving set. Pieces include a footed cake stand, cups and saucers, coasters, ashtrays, and a 7" plate. Harp is another 1950s pattern that can be found in the Shell Pink Milk Glass line. Holiday (Buttons and Bows) - (pink 1947-1949) (Crystal, Iridescent 1947-1975) ( Shell Pink 1958-1959) - The Jeannette Glass Company produced Holiday and found that it was one of its most popular pink Depression Glass like patterns. It is listed in many Depression Glass books, but was not introduced until 1947. This lovely pattern is moderately priced. Dinners, cups and saucers, serving pieces, pitchers and flat tumblers are easy to find. 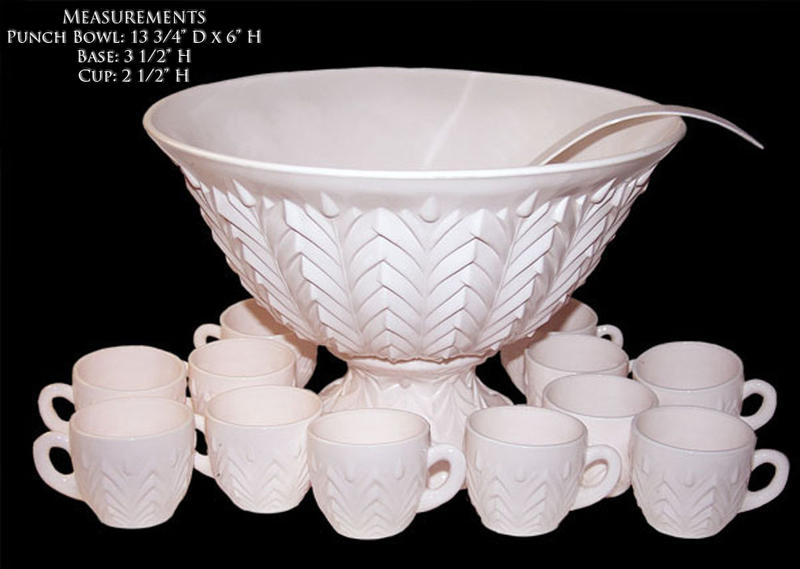 Harder to find items include the cake plate, footed tumblers, and large fruit or console bowl. 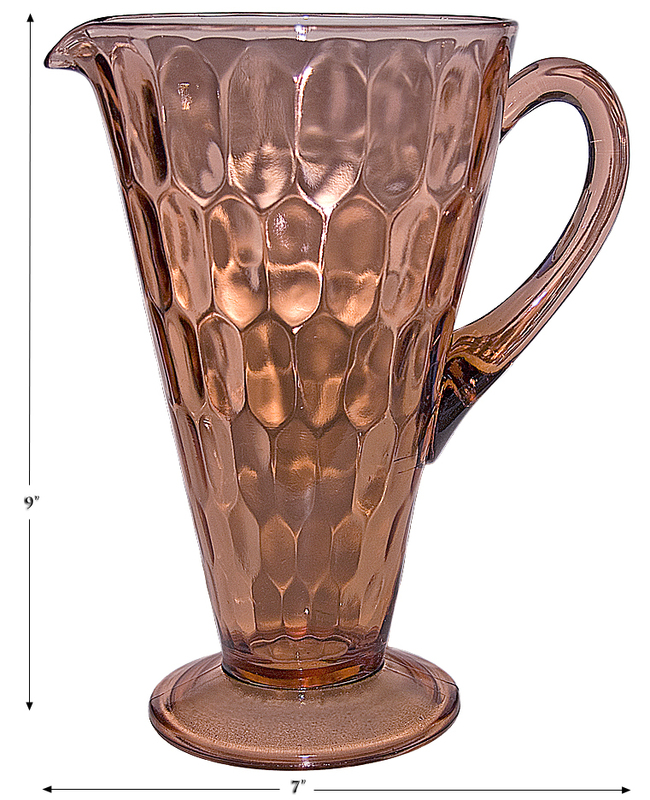 Homespun - (Pink, Crystal, and some fired on colors) (1939-1949) - This lovely pattern of vertical lines with tiny vertical ribs is a creation of the Jeannette Glass Company. Most pieces of Homespun have a waffle pattern in the bottom. Contrary to what was first believed, all pieces in this pattern do not have the waffle pattern present. Production of Homespun began in 1939. 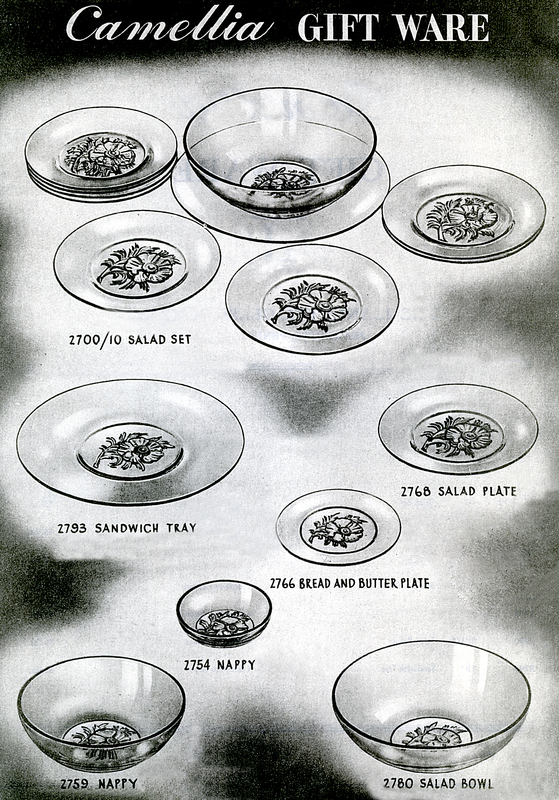 Jeannette is one of the few companies that produced children's dishes (just like mothers) to go along with their Depression Glass Sets. Homespun has a matching child's set. A pitcher was made to go with the Homespun set. It looks identical to Hazel Atlas's Fine Rib patterned pitcher. 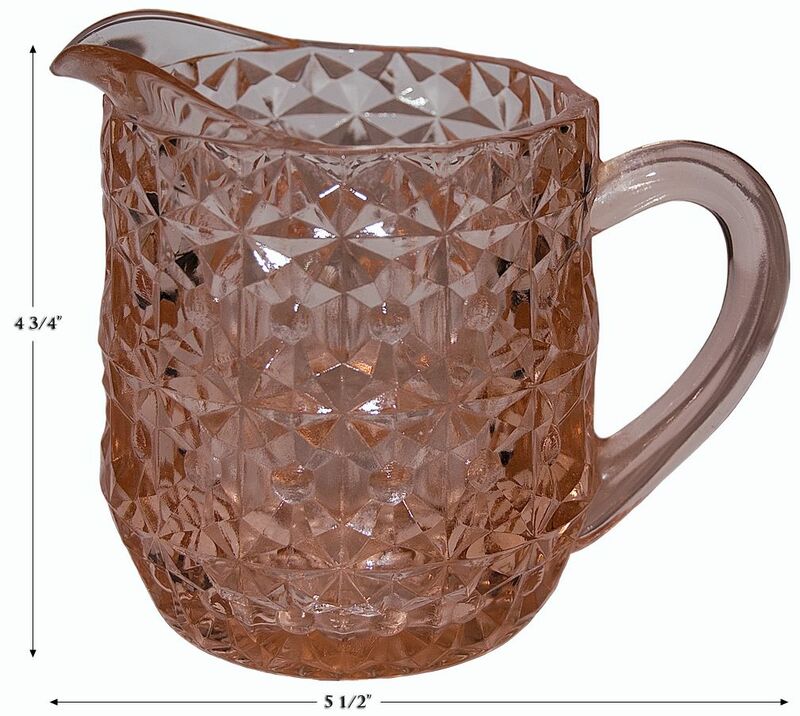 An original catalog reprint confirms that Jeannette did indeed make this pitcher and sold it with the Homespun pattern. ,Iris - (Crystal-1928-1932, Iridescent-1950s, Multicolored-1970s) - Jeannette started production of Iris in crystal during the Depression years. Later, in the 1950s, iridescent Iris was made. In the 1970's, flashed colors were produced. The iridescent candy bottom was also made during this time period. Quite a few pieces of crystal Iris have been reproduced by A & A Imports. Crystal dinner plates, flat tumblers, footed ice teas, and coasters have been made. At this time other items have not been remade. Although these items can be told from the originals, it is difficult. The detail in the glass and the clarity of the glass helps to identify the old from the new. 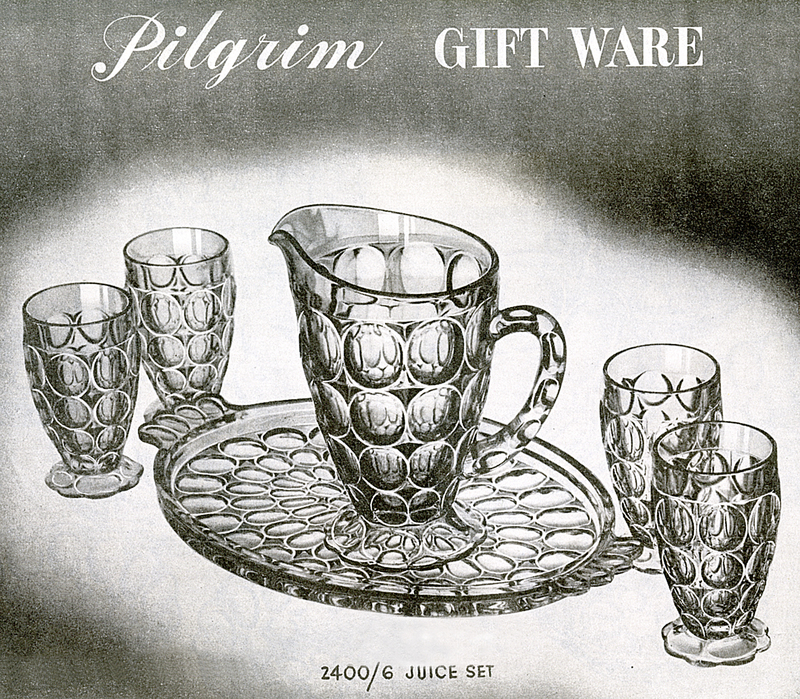 National Gift Ware is a pattern that was introduced in the late 1930's. We have an original glass ad from a Jeannette catalog from this time period. National Gift Ware was a heavy vertical ribbed pattern. Many, but not all of the pieces had tiny ringed circles in the bottom. 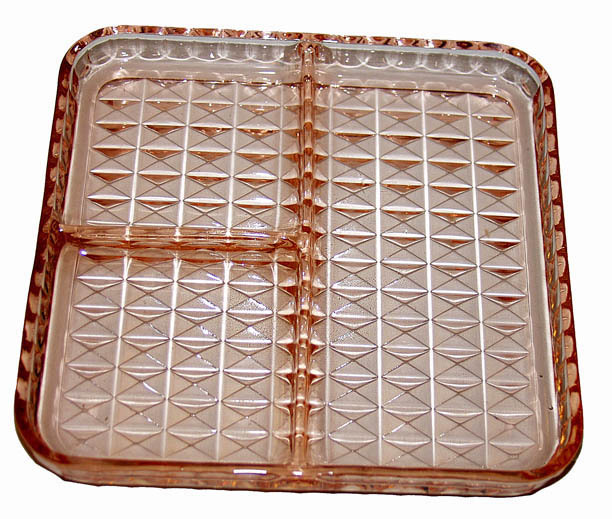 Because of the heavy nature of the glass, this pattern was durable and not easily damaged. Pieces included a relish, a covered candy, a sugar and creamer, bowls of various sizes, pitchers, salt and pepper shakers, trays, a cigarette set, and vases. 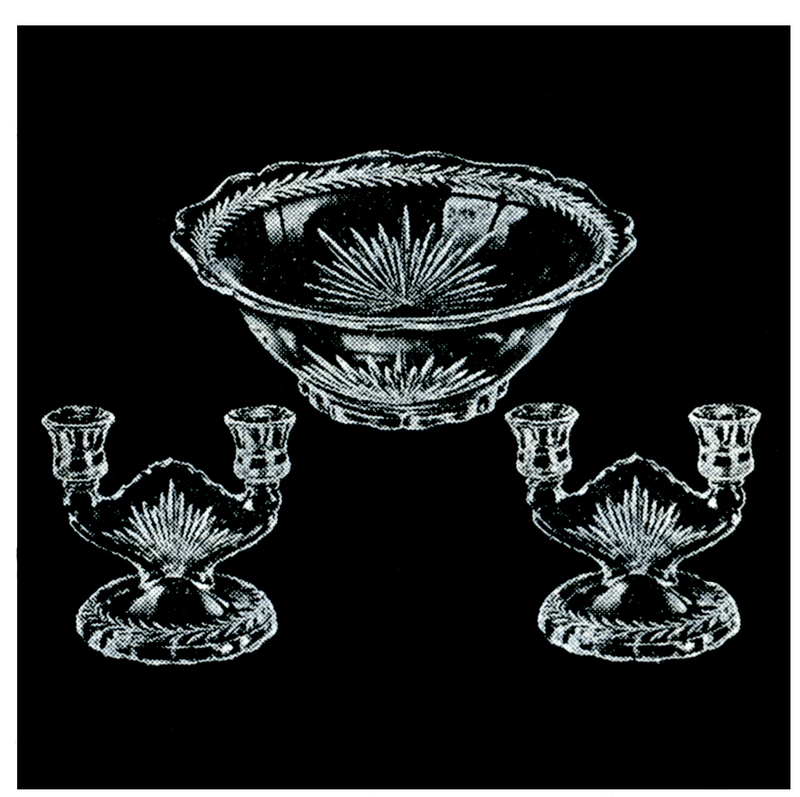 This glassware was popular in both homes and eating establishments and remained in the Jeannette line for a good many years. Pilgrim (Thumbprint) - (Late 1930s -1950s) (Ice Blue) (Crystal) (Crystal with Gold Decoration - Jeannette designed and produced pieces in the Pilgrim pattern in the late 1930s. Bowls, pitcher and tumbler sets, stemware, and trays, were offered for sale in this interesting pattern of vertical spaced ovals. The name "Thumbprint" immediately comes to mind. Almost every large glass company from this time period had their version of a Thumbprint pattern. 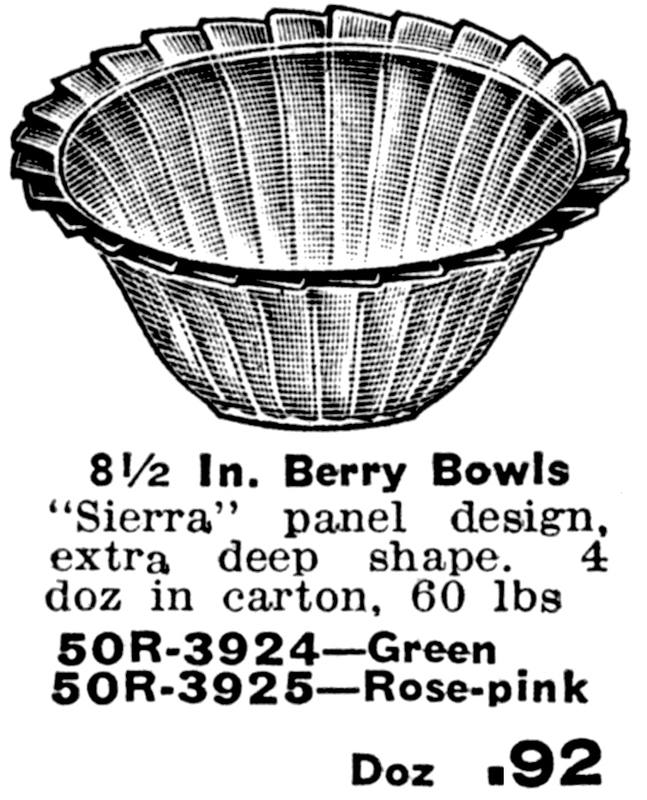 In the 1950s Jeannette used the Pilgrim molds in their Shell Pink Milk Glass line. They renamed the pattern Thumbprint. A small pitcher and tumbler set, goblets, and sherbets were offered for sale in this pretty color. 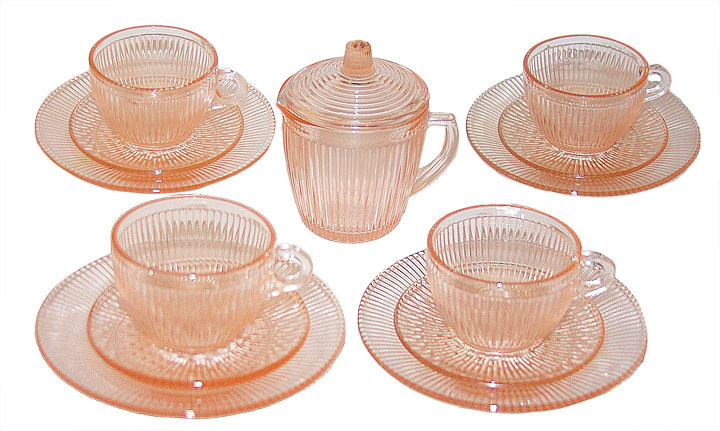 Shell Pink Milk Glass- (1958 - 1959) - In the late 1950s, pink milk glass became popular. Fostoria, Fenton, and Cambridge all had their versions of this color. 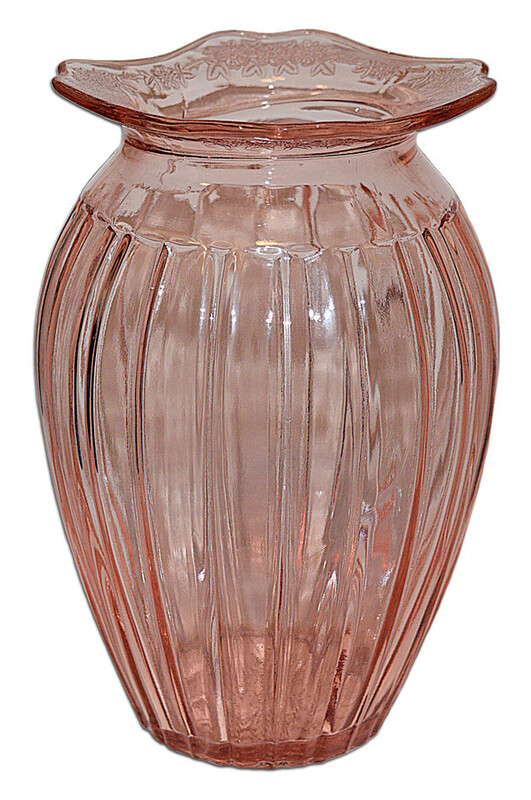 The Jeannette Glass Company introduced Shell Pink in 1958 and discontinued this pretty color in 1959. Shell Pink Milk Glass was made in a variety of pieces which included a punch set, pitcher, tumbler, goblet, cookie jar, candlesticks, bowls, compotes, vases, a puff box, cigarette box, relish, snack set, honey jar, cake stand, lazy susan, creamer, sugar and lid, and a footed nut dish. Experimental items have been found which include an ashtray, the deer powder jar, and a large covered duck jar. Most of the pieces were made as accessory items to use alone or together. Jeannette used many different molds and patterns to put together this interesting assortment. Sierra (Pinwheel) - (1931 - 1933) (Green, Pink, Ultramarine) - Sierra is a stylized pattern with sharp edges and vertical lines. The pinwheel scheme is embossed, which creates sharp edges on the surface of the glass. The effect is beautiful, but due to the numerous uneven edges, finding pieces of Sierra in undamaged condition is a challenge. The Pink ad Green colors are both popular, although finding green Sierra is a bit more taxing. The only piece of Sierra to have been found in Ultramarine is a cup, so if you are wanting to collect Jeannette's signature color, this pattern would not be for you. If you are looking for a Deco Depression Era pattern in Pink or Green you will love this one. 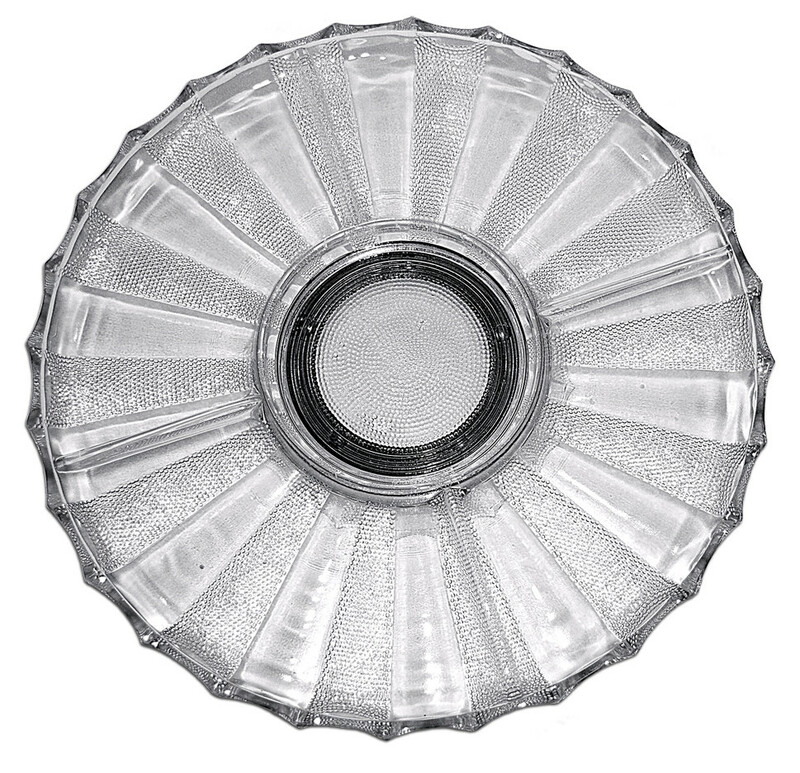 Sunburst - (Late 1930s -1940s ) (Crystal) - Sunburst was made by the Jeannette Glass Company in the late 1930's and 1940's. Most of the pieces have the same mold shape as the Iris and Herringbone pattern listed above. Because of the similarity in shape, some Iris collectors buy pieces of the Sunburst design to use with their pattern. The pattern gets its name from the starburst or sunray design that graces each piece. Sunburst was available as a full service dinnerware set. It could be purchased as a 34 or 44 piece dinner set, or in a smaller luncheon set size. Accessory pieces such as tumblers, and the bowl and candlesticks were offered for sale individually or in the larger sets. Sunflower - (1930s) - (Pink, Green, Delphite, Ultramarine, Experimental Colors) - Sunflower is a fairly large Depression Glass set that was made in the 1930's. The shapes are very similar to Floral Poinsettia. The only drawback to collecting this pretty pattern is the lack of serving pieces available. There is no butter dish, platter, candy, or pitcher. Most people or not aware of the fact that Jeannette's 2 cup measuring cup often came with the Sunflower Motif in the bottom and that it was made to go with the set. Swirl - (1937- 1938) (Ultramarine, Pink, Delphite) - Swirl or spiral patterns were popular during the Depression years and most major companies had their own version of a spiral pattern. The Jeannette Glass Company produced a complete line of dinnerware with the swirl effect and named it aptly, Swirl. There are quite a few pink collectors, but Swirl was most popular in the Ultramarine color. Ultramarine was a deep turquoise blue color that Jeannette was famous for. The Ultramarine color had a tendency to vary in production. Some pieces are almost a flat deep green color. There are collectors for the deep rich Ultramarine color, and the more subdued "green." When you are ordering from the internet you need to be sure that you know what color variation you are receiving. Most dealers refer to the flat ultramarine color as green. There are several experimental pieces that have been found in amber and ice blue. This setting includes many serving pieces as well as a full size dinner plate. Some hard to find pieces are the candy dish, butter dish, and flat ice tea tumbler. 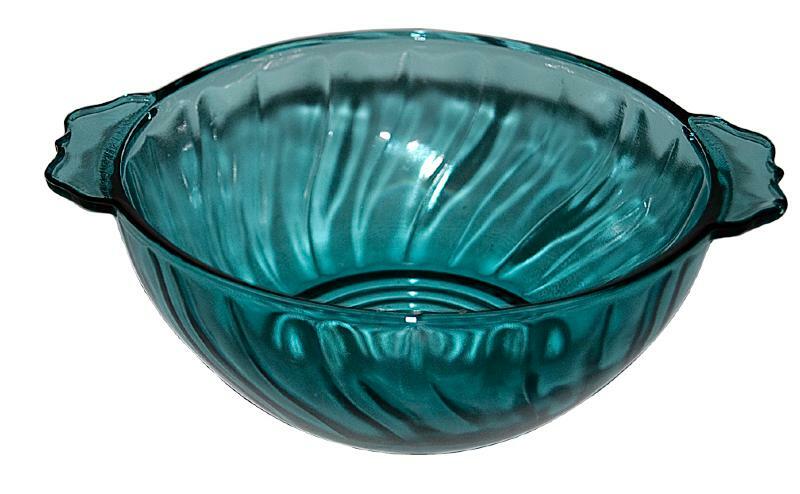 Windsor (1936-1946) - (Amberina, Crystal, Delphite, Green, Ice blue, Ruby) - Windsor was made by the Jeannette Glass Company. We have listed quite a few colors, but Windsor is commonly found in Crystal, Pink, and Green. You rarely find pieces of the other colors, and finding a complete set of any of them would be virtually impossible. Pink and Green seem to be the most collectible colors, however quite a few collectors look for crystal. Some hard to find items include cream soups, ice tea tumblers, and candlesticks. 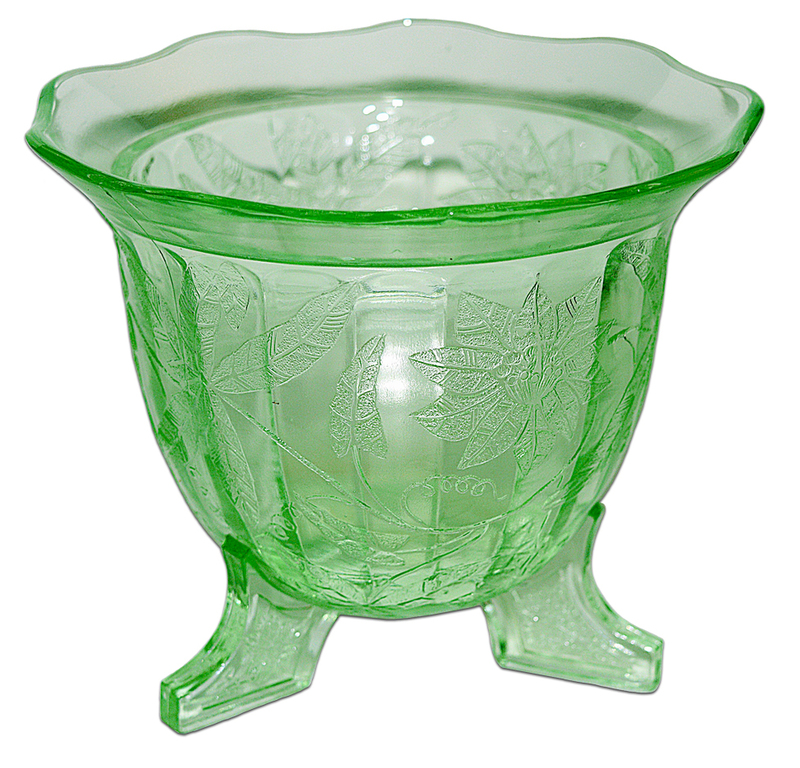 Green Transparent (Jeannette) (1930s) -The Jeannette Glass Company, made a large line of kitchenware in a pretty transparent green to match their Depression Glass dinnerware sets. Hex Optic which is a Jeannette luncheon set had an accompanying grouping of kitchen items to match in both green and pink. Jeannette made kitchen ware pitchers, measuring cups, leftovers, covered salt and butter boxes, mugs, reamers, sugar shakers, ice buckets, and mixing bowls. They even made a leftover set with their famous Floral Poinsettia pattern embossed on the inside of the lid. 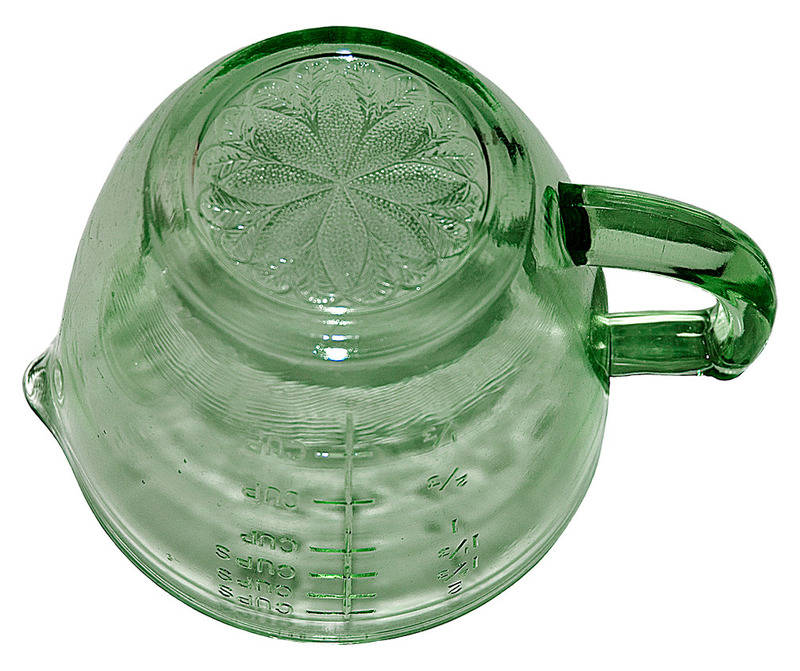 Jeannette's green kitchenware was made to be used not only with Jeannette's Depression Glass sets, but also with any of their major competition's sets as well. The stylish designs insured that their products would be popular and appeal to many home shoppers. As a result, today it is still possible to add this pretty kitchenware to your kitchen decor. Jadite Jeannette - (1930s) - Jeannette's Jadite, (sometimes spelled Jade-ite by other companies) came in two shades. A dark jadite and a lighter one. Jeannette's jadite colors were among the prettiest Jadite produced during the 1930's. 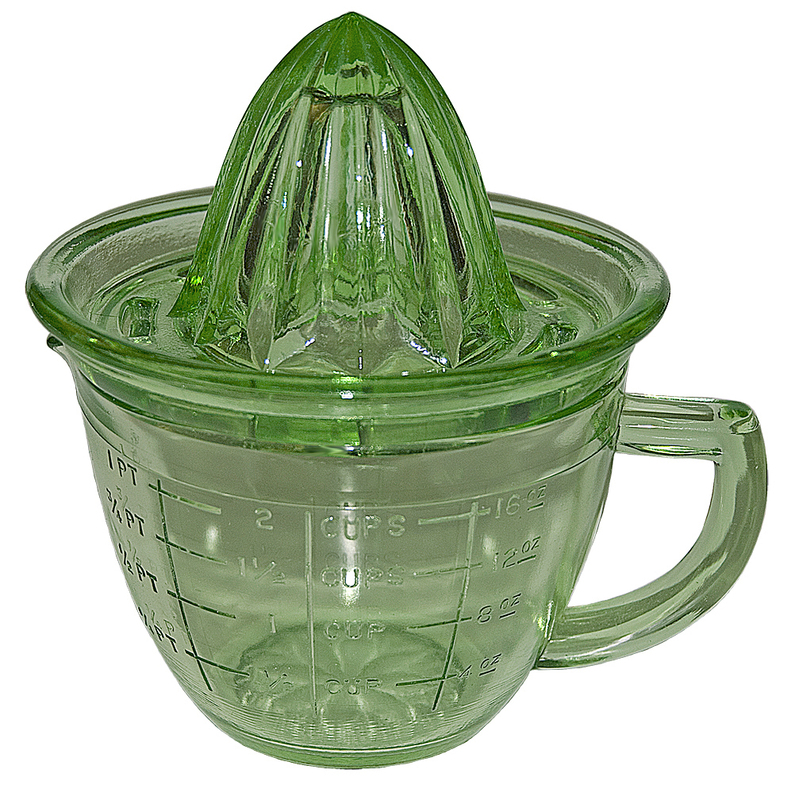 Jeannette's Jadite Kitchenware line was one of the largest lines of jadite produced. There were more pieces made in Jeannette's Jadite line than there were in their Delphite line. 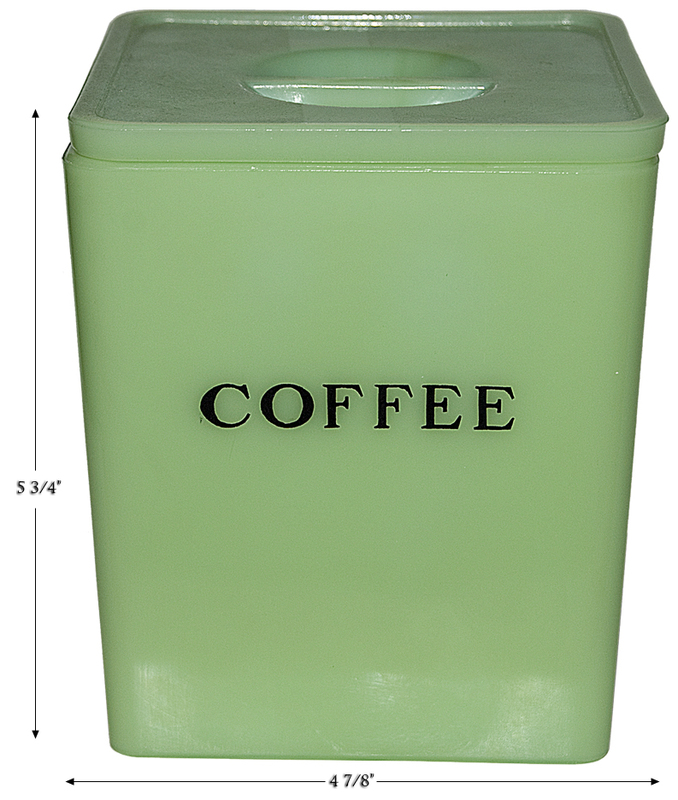 The Jadite kitchenware had three different styles of canisters. Many accompanying pieces were made to go with these canisters. A complete list of the pieces can be found on our other Jadite pages. Many collectors of Jeannette's Jadite combine it with McKee's jadite kitchen items. Light Jade/Yellow (Jeannette) - (1930s) Most of the major Depression Era Companies had their version of yellow milk glass. 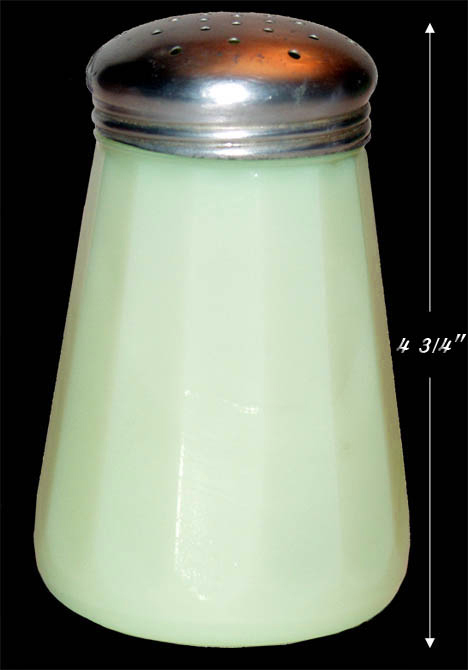 The Jeannette Glass Company may have attempted to produce this color with their light jade (nearly yellow) paneled sugar shaker. Since this is the only light yellow piece that Jeannette made, it just may have been an occasional fluke in the composition of the glass used that day. However, other jade items are not found in this color which leads one to believe that the light yellowish color was intentional. If so, it must not have created much interest among customers and Jeannette decided not to make other items in this color. Jenny Ware (Jeannette) - (1930s) (Crystal, Pink, Ultramarine) - Jeannette produced a very large line of kitchenware in a attractive patten called Jenny Ware. This pretty ribbed pattern was made in crystal, pink, and ultramarine in the 1930s. The ultramarine color was designed to go with Jeannette's Ultramarine Depression Glass patterns. 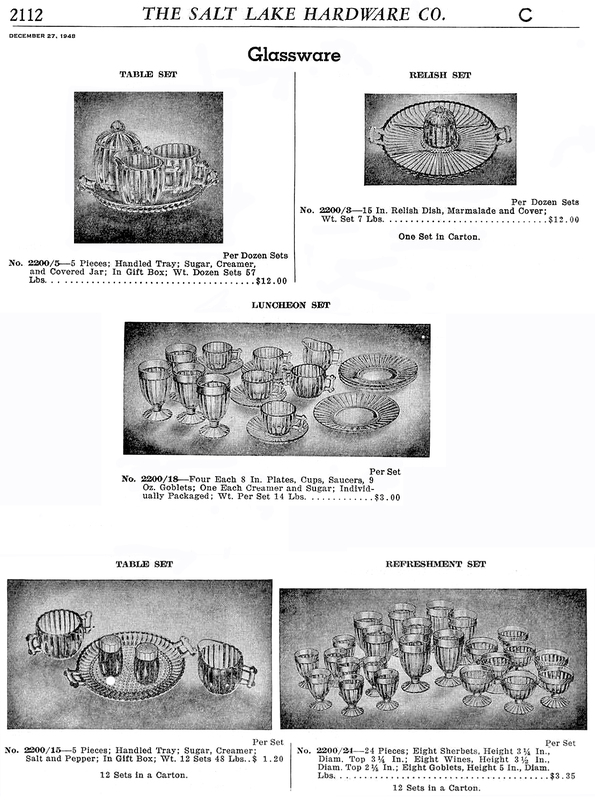 Pieces in this kitchenware pattern include a pitcher, tumblers, mixing bowls, round and rectangular leftovers, a butter, a reamer, and a four piece tab-handled measuring cup set. This is one of the nicest collections of transparent patterned kitchenware ever made. Jeannette was the only company to make an Ultramarine colored collection of kitchenware. 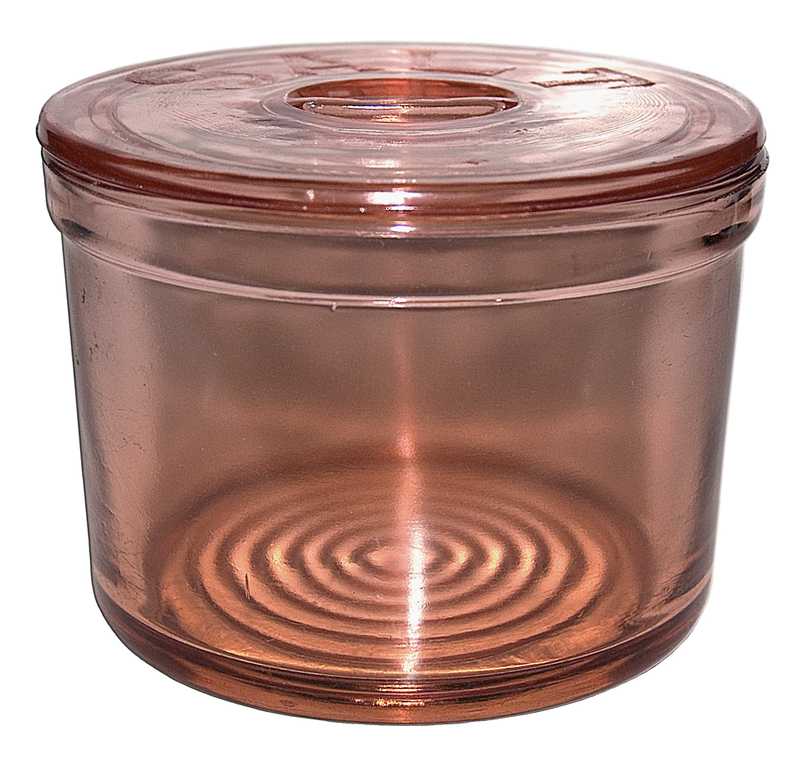 Pink Kitchen Glassware - (1930s) - Jeannette made many Pink Depression Era kitchen items. They were an innovative company and added patterns to many of their kitchenware shapes. Most pink kitchenware will be found with a pattern. Jenny Ware and Hex Optic patterns were very popular and sold well in the pink color. Plain (non-patterned) kitchenware was made to use with the patterned kitchenware or with any Depression Era pattern.